Finally: proof that the Flaming Carrot is REAL!!! With comics on the fast track to the movie screen, isnt it time that the movie screen came to comics? Flaming Carrots great detective-ness gets to the bottom of a mysterious series of events at a comic convention! Everyones pockets are disappearing! 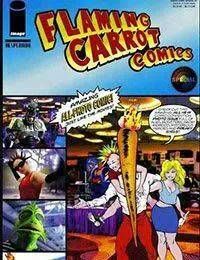 Will Flaming Carrot discover the mystery in time or get side-tracked by the convention sirens? Fun, action and numerous cameos by comic book celebrities! Filmed Fumetti style!